82 Marlborough is located on the south side of Marlborough, between Berkeley and Clarendon, with 80 Marlborough to the east and 86 Marlborough to the west. 82 Marlborough was designed by Sturgis and Brigham, architects, and built ca. 1876 as the home of James Lawrence and his wife, Caroline Estelle (Mudge) Lawrence. They also maintained a home in Groton, where James Lawrence owned and operated a farm. Caroline Estelle Lawrence purchased the land for 82 Marlborough on January 26, 1876, from her brother-in-law, Charles Henry Joy. Charles and Marie Louise (Mudge) Joy lived next door, at 86 Marlborough, which they had built ca. 1872. The land on which 82-86 Marlborough were built was part of a 220 foot parcel Henry Lee, Jr., and Jonathan Amory Davis purchased from the Commonwealth of Massachusetts on November 14, 1863. J. Amory Davis died in May of 1865 and his interest was inherited by his daughter, Ann Wainwright Davis. On October 6, 1865, she transferred her interest in the eastern 160 feet to Henry Lee, and he transferred his interest in the western 60 feet to her. On October 14, 1865, Henry Lee, Jr., entered into an agreement with architect and builder Charles K. Kirby to sell him the 160 foot lot, subject to Charles Kirby’s agreement to build nine houses on the land. 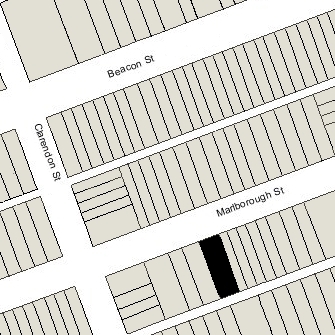 Ultimately, Charles Kirby built five houses at 72-80 Marlborough on the eastern 89 feet 9 inches of the land, and on October 21, 1871, Henry Lee, Jr., sold Charles H. Joy the remaining 70 feet 3 inches to the west, where 82 and 86 Marlborough were built. Click here for an index to the deeds for 82 Marlborough. When Charles Kirby built 80 Marlborough, he placed the one-foot thick western wall of the house entirely on the land for that house, rather than placing half of the width on the lot to the west, where 82 Marlborough later would be built, as was the usual custom. When he sold 80 Marlborough in June of 1868, he retained the western 6 inches, with half of the party wall on it, and on January 20, 1876, sold it to Caroline Estelle (Mudge) Lawrence. The Lawrences continued to live at 82 Marlborough during the 1881-1882 winter season. They then moved briefly to 84 Beacon, and by the 1883-1884 season were living at a new home they had built at 215 Commonwealth. On July 20, 1882, 82 Marlborough was purchased from Caroline Estelle Lawrence by Anna Maria (Warren) Glidden, the wife of John Murray Glidden. They previously had lived at 10 Marlborough. John Glidden was a partner in his father’s shipping firm of Glidden & Williams, a major owner of clipper ships operating between Boston and San Francisco. After the firm was dissolved in 1877, he became a commission merchant and also was president of the Pacific Guano Company. The Gliddens continued to live at 82 Marlborough during the 1888-1889 winter season, but moved thereafter, probably to the Glidden family home, Gladisfen, in Newcastle, Maine. By the 1889-1890 winter season, 82 Marlborough was the home of attorney Francis Inman Amory and his wife, Grace Josephine (Minot) Amory. They previously had lived at 265 Beacon. They continued to live at 82 Marlborough during the 1890-1891 season, but moved thereafter to 168 Beacon. 82 Marlborough was not listed in the 1892 Blue Book. On March 1, 1892, 82 Marlborough was purchased from Anna Glidden by Francis Augustus Brooks. He and his wife, Frances (Butler) Brooks, made it their home. They previously had lived at 372 Boylston. Francis Brooks was an attorney specializing in railroad and corporate matters. Frances Brooks died in December of 1892. 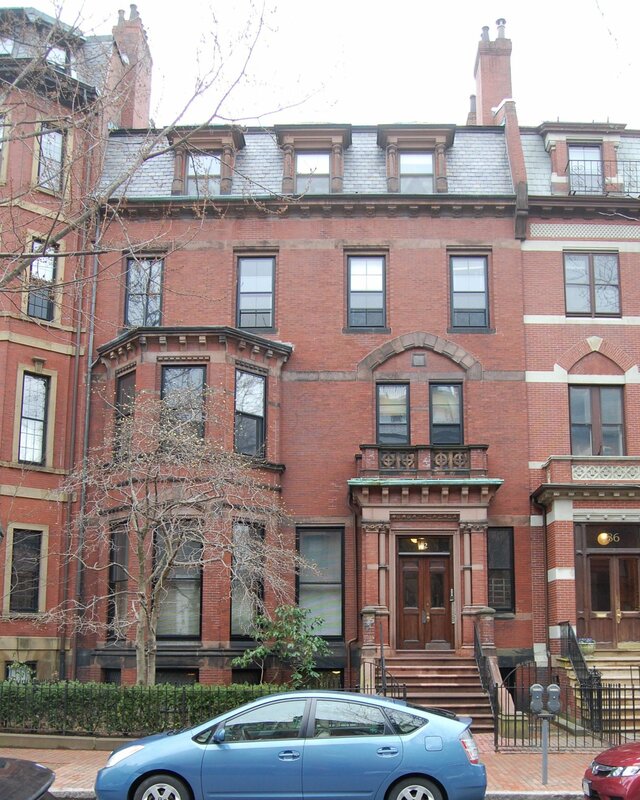 Francis Brooks continued to live at 82 Marlborough with their unmarried sons, Frederick Brooks, a civil engineer, and Charles Butler Brooks, a broker. By 1898, they had been joined at 82 Marlborough by Miss Mary Ellen Atkinson. She was the step-daughter of Frances (Butler) Brooks’s deceased sister, Henrietta (Butler) Atkinson, the wife of Rev. Timothy Atkinson. Francis Brooks died in September of 1902. On February 25, 1904, 82 Marlborough was acquired from the estate of Francis Brooks by George D. Coleman, a chemist and president of the International Ship Coppering Company. He and his wife, Augusta D. (Jensen) Coleman, lived at 181 Huntington. On February 4, 1905, Frederick Brooks acquired the property from him. Frederick Brooks, Charles Brooks, and Mary Atkinson continued to live at 82 Marlborough during the 1904-1905 winter season. They moved thereafter, Frederick and Charles Brooks to 25 Brimmer, and Mary Atkinson probably to Brookline, where she died in July of 1908. On August 4, 1905, 82 Marlborough was acquired from Frederick Brooks by Julia (Shepley) Coolidge, the wife of architect Charles Allerton Coolidge. The Coolidges lived in Jamaica Plain and did not move immediately to 82 Marlborough, and during the 1905-1906 winter season, it was the home of dry goods merchant Samuel Parker Bremer and his wife, Mabel Ruth (Burrage) Bremer. They previously had lived at 33 Bay State Road. By the 1906-1907 winter season, the Bremers had moved to 33 Marlborough, and 82 Marlborough had become the Coolidges’ home. They also maintained a home in Marion, Massachusetts. By the 1924-1925 winter season, they had been joined at 82 Marlborough by their son-in-law and daughter, Frederick (Frederico) Deane and Julia Shepley (Coolidge) Deane. Frederick Deane was a banker and broker. They previously had lived in China. Julia Coolidge died in July of 1935, and Charles Coolidge died in April of 1936. By the 1936-1937 winter season, the Deanes had moved to 6 West Hill Place. On September 1, 1936, 82 Marlborough was purchased from the estate of Charles Coolidge by Dr. William Grout Barrett, Dr. John M. Murray, and Dr. M. Ralph Kaufman, all physicians and psychiatrists. In July of 1937, they applied for (and subsequently received) permission to remodel the house and convert 82 Marlborough from a single-family dwelling into medical offices. After the remodeling was completed, they maintained their offices there and leased space to other doctors. Dr. William Barrett and his wife, Anne Dorothea (Nagel) Barrett, had lived at 80 Marlborough from about 1932 to 1934, after which they moved to Cambridge. Anne (Nagel) Barrett was the maternal niece of Julia (Shepley) Coolidge, the daughter of Charles Nagel (US Secretary of Commerce and Labor during the Taft Administration) and Anne (Shepley) Nagel. Dr. John Milne Murray and his wife, Edna (Frick) Murray, lived in Winchester. In addition to his medical practice, he was a professor at MIT. During World War II, he was chief psychiatrist to the US Army Air Forces and after the war was a professor at Boston University School of Medicine. Dr. Moses Ralph Kaufman and his wife, Ida Elizabeth (Esack) Kaufman, lived in Belmont. After World War II, he became the first director of psychiatry at Mt. Sinai Hospital in New York City and served as its psychiatrist in chief. On April 30, 1938, Drs. Barrett, Murray, and Kaufman transferred 82 Marlborough to themselves as trustees, each with one-third beneficial interest. William and Anne Barrett separated, and he moved to San Francisco by 1947. On June 12, 1947, William Barrett resigned as a trustee and the trust was amended to provide that John Murray and M. Ralph Kaufman each had a one-half beneficial interest. 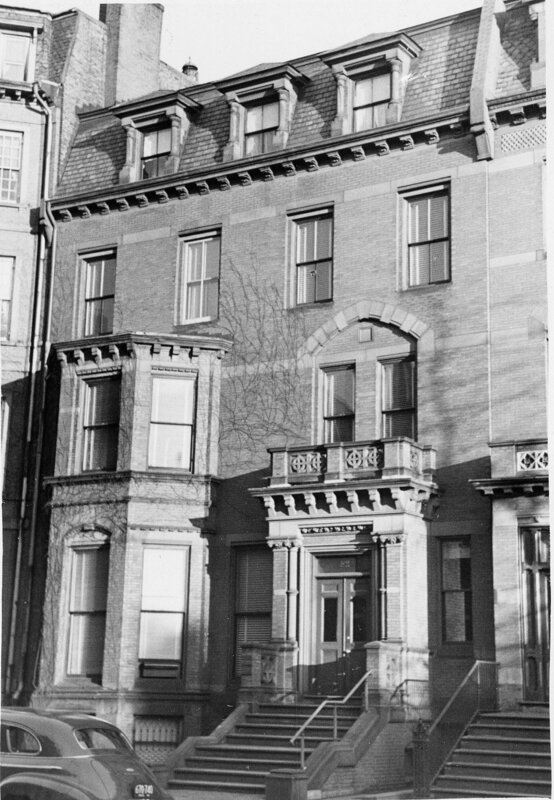 In December 31, 1947, Dr. Murray and Dr. Kaufman transferred 82 Marlborough to 82 Marlboro Street, Inc.
Dr. Kaufman and Dr. Murray were both founding members of the Boston Psychoanalytic Society and Institute, and served as its president at various times in the 1930s and 1940s. 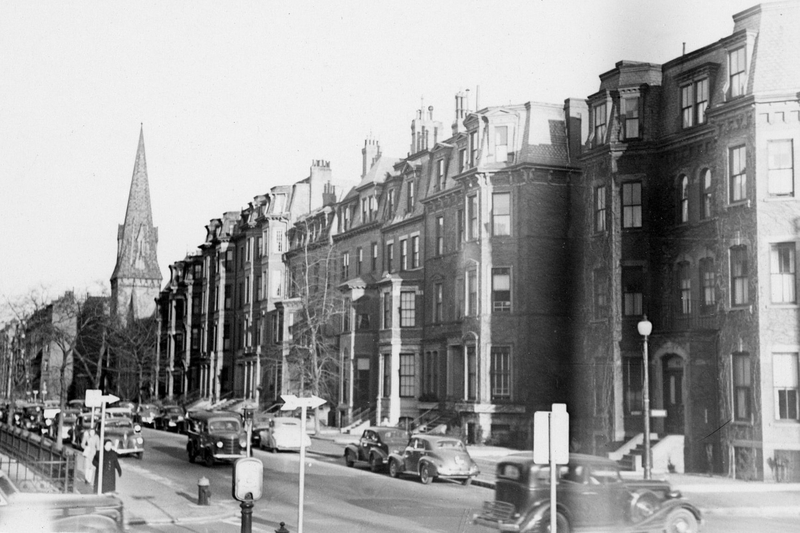 By 1947, and probably before, the society’s its offices were located at 82 Marlborough. They remained there until 1952, when the society purchased and moved to 15 Commonwealth. 82 Marlborough remained doctors’ offices in the 1970s. On February 7, 1979, Michael Marcus and his wife, Elizabeth Marcus, and Robert Jeremy Grantham and his wife, Hannelore Grantham, purchased 82 Marlborough. Each couple owned an undivided half interest in the property. On August 29, 1983, Robert and Hannelore Grantham transferred their interest to Michael Marcus and Elizabeth Marcus, and on March 12, 1984, they transferred the property to themselves as trustees of the Eighty-Two Marlborough Trust. The property remained medical offices and at least one apartment in 2015.